Despite a dismal year, the market closed out 2018 on a bright note. France’s president warns order will be kept “without complacency” after violent anti-government protests. Of course, the year’s most bonkers superhero movie had to be jam packed with equally bonkers references and comic book shout-outs–what would you expect from a movie with a battle drum-playing, bejeweled octopus? Though they might not be as many direct comics winks and nods as you could find in something from the MCU, the DCEU does a fantastic job of adapting its often densely packed source material for the screen, and Aquaman is no different. Adapting Arthur’s myriad stories and origins into one cohesive, two and a half hour movie meant the movie took plenty of cues from the source material, and in the process managed to sneak in some off-kilter Easter Eggs along the way. Randal Park made a surprise cameo as Dr. Stephen Shin, a character from the New 52 era of Aquaman comics who, much like his on-screen incarnation, is a human obsessed with finding Atlantis. It’s hugely apparent that we haven’t seen the last of Dr. Shin in the live action universe, so it would be best to keep an eye out for him in the future. Did you catch that octopus absolutely wailing on the drum set during Orm and Arthur’s big arena fight? That was a wink to Topo, the musically talented aqua-pet who, yes, really did exist in the comics. During the final battle, Arthur rides into the fray on a giant war-seahorse., This is a nod to yet another one of his aqua-pets, Storm the seahorse, Aquaman’s trusty steed. The terrifying deep sea monsters Arthur and Mera encountered on their way to the final resting place of the trident were The Trench, an offshoot race of Atlantis who, after being sent deep into the Marianas Trench eons ago, evolved into monstrous humanoids able to survive without light or much food. The pilot of the plane that (literally) drops Mera and Arthur off in the Sahara is Leigh Whannell, director James Wan’s long time collaborator and occasional leading man–you can spot him in Wan’s other projects like Saw, Insidious, and The Conjuring. The strange, dinosaur infested dimension that Arthur and Mera find Atlanna trapped in along with the trident is never specifically named in the movie but is a clear nod to one of the weirdest locations on DC’s Earth: Dinosaur Island, a magically cloaked Land of the Lost style island where dinosaurs reign supreme. While Orm and Manta’s respective comic book origins have been updated and revised dozens of times over, their inherent mutual hatred and shared goal of destroying Aquaman is pretty consistent. In the New 52 era, Orm and Manta even teamed up, much like they do in the movie. The the comic book collabo Orm hired Manta to try and steal Atlan’s trident–a plot you’ll probably recognize as being used in the film too. Arthur and Orm’s bad blood wasn’t invented just for the movie–their relationship has always been dicy, even dating back to the pre-1980s comics where Orm was actually Arthur’s fully human half-brother named Orm Curry, rather than a full blooded Atlantean. Orm’s story was revised after Crisis on Infinite Earths to make him half-Atlantean, and then revised again in The New 52 to make him a full blooded Atlantean war lord. Much like Orm, Arthur’s origin story has been updated and revised time and time again, but the version we see on the big screen is actually part of the comic book canon. Arthur’s connection to his mother, Atlanna, and his father, Tom Curry, was largely solidified during the New 52 era of DC. Prior to that, Arthur was largely considered to be the son of Atlan The Wizard, an Atlantean magician–he even had a brief period of being raised by dolphins the same way Tarzan was raised by apes. Best not to ask about that one. Arthur’s hometown of Amnesty Bay is also a major component lifted from the comics–but it’s not as vintage as you might assume. Amnesty Bay was first named in 2009, during the Brightest Day event which featured Aquaman returning to his father’s lighthouse on the water. Orm’s trusted right hand man, Murk, is another blink-and-you’ll-miss-it comic book cameo. A recent addition to the Aquaman pantheon, Murk was first introduced in 2013 as the captain of the Atlantean army, the Men-of-War.. His loyalty to Orm and his hatred of the surface dwellers have been a major part of his character since then, making his role in the movie a very close translation. Where would we be without memes in superhero movies? Of all the completely buckwild audio stingers in Aquaman, perhaps the most buckwild of all was the Pitbull remix of Africa by Toto, the internet’s favorite power ballad about blessing the rains and traveling to, well, Africa. Don’t lie–even if you’ve never picked up an Aquaman comic in your life, chances are you know his name and can recall that part of his powers include “talking to fish.” Of course, the truth is a little bit more complicated than that–but the movie does a great job of streamline Arthur’s weird communication abilities into an easy on-screen representation. It manifests in the movie when he sends a psychic wave through the water and summons a whole army of creatures to fight with him against Orm. Brett McGurk, outgoing U.S. envoy to the global coalition fighting ISIS, resigned over Trump’s Syria withdrawal plan. Skies are illuminated above cities around the world as revellers welcome the arrival of the New Year. 2018 showed an explosion of creativity can ensue when filmmakers are liberated from the burden of being the Only One. Epic is celebrating a successful year of Fortnite with an in-game New Year’s Eve event occurring every hour today. When the clock hits a new hour, all players in a Fortnite match will see a giant disco ball rip through a rift in the sky. A countdown starts while music begins to play. 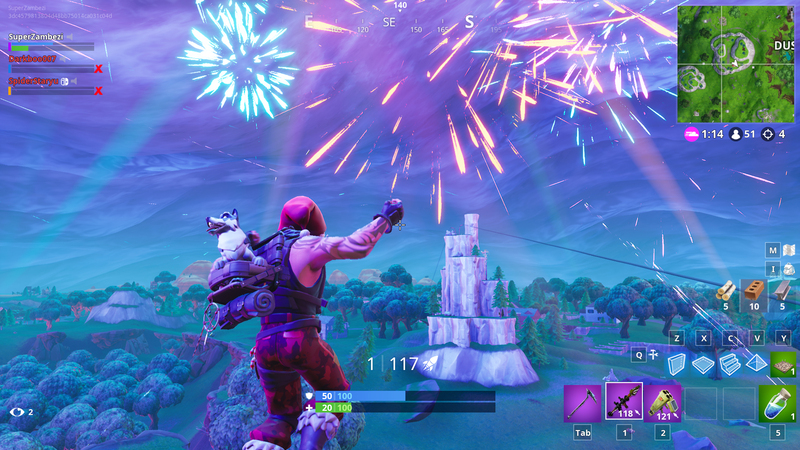 Fireworks overlooking Dusty Divot and Salty Springs. When the countdown reaches zero, a barrage of fireworks are released and every player is forced to boogie down for 10 seconds, no matter if you were in the middle of a fight or just minding your own business. The event concludes with a giant firework of a llama with a promising “2019” underneath. As reported by CNN, the rocket-powered plane, flown by two veteran pilots, reached a maximum altitude of 51.4 miles, exceeding the 50-mile altitude that NASA considers the edge of space, but not quite the 62 miles that the widely-accepted Karman Line denotes as the edge of space. This point is vaguely defined, largely due to the nature of Earth’s atmosphere not ending at any particular hight, but rather becoming progressively thinner as altitude increases. It’s a new week, which means you can find a new set of deals on PS4, Xbox One, and Nintendo Switch games at Best Buy. Maybe you got a gift card over the holidays, maybe you’re planning to return something and you’ll have store credit, or maybe you’re just looking to save some cash on a game. Whatever the case, here are this week’s video game discounts worth checking out. You can save $40 on the PlayStation Classic mini console, bringing the price down to a much more reasonable level at $60. Select Xbox One controllers are $10 off. If you buy an Xbox One S or X, you’ll get a free $50 e-gift card. If you’re willing to place a pre-order, you can get additional deals if you have a free My Best Buy membership. Pre-order Kingdom Hearts 3, and you’ll receive a $10 reward certificate and a free keychain. You can also get a $10 reward, along with some in-game goodies, for pre-ordering BioWare’s shared-world shooter Anthem. As for games that are available now, many of the discounts are holdovers from previous weeks, but no matter: a good deal is a good deal. Battlefield V, which has only been out for a month, is half off at $30. The similarly new game Fallout 76 is down to $40, but if you’d rather explore an offline version of the wasteland, try Fallout 4 GotY Edition for $30. While you won’t find any deals this week on Red Dead Redemption 2, Xbox One owners can pick up the Xbox 360 game Red Dead Redemption (playable on Xbox One via backwards compatibility) for $10. Switch owners can grab the one-two punch of America’s Greatest Game Shows: Wheel of Fortune & Jeopardy for $20. You can find more of our picks below, or you can check out the full list of video game deals on Best Buy’s sale page. Americans have some questions that need answers.